We learned the Inlaid Designs technique from guest teacher Carmen Iclodean of Earth’s Raw Beauty. 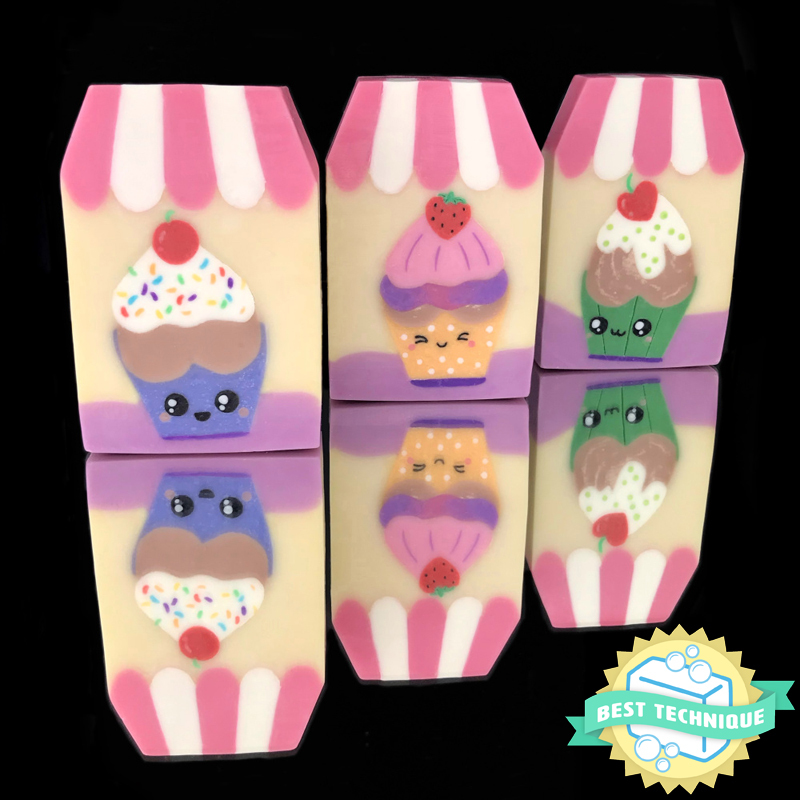 Carmen has been perfecting the technique over the past several years and has created many beautiful soaps that leave you wondering – how did she do it? The technique opens up a wide world of design possibilities that are impossible to achieve any other way. Members took advantage of this aspect of the technique as they created their soapy masterpieces for the challenge. Our sponsor this month is Elements Bath & Body. 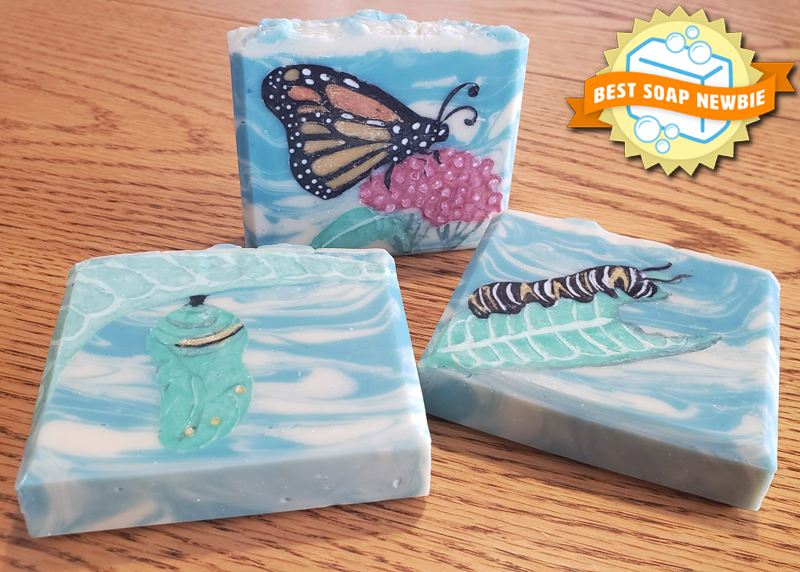 They offer a wide variety of wholesale soap making supplies, bath and body supplies, recipes, packaging, and accessories to suit any soap making or cosmetic requirements, and they also ship internationally! We are so grateful for their support and offering gift certificate prizes to the top three winners in both the regular and advanced categories! We have several sets of winners for the regular and advanced categories. The top three spots are voted by the members, the Sponsor’s Choice awards are chosen by Elements, and I have chosen several entries to receive special recognition awards. Let’s start with the advanced category, where members had to have at least one embed running through their soaps in addition to their inlaid design work. Liz created an embed for the red and white parts of the lighthouse which was carefully placed as she poured the land, sea and sky around it. All the other details are part of the inlaid design. The silver light is especially spectacular! Congratulations on your $50 gift certificate prize from Elements, Liz! I’ve also chosen this entry to receive the Best Presentation award in the advanced category as the soaps are presented exceptionally well. The photo is perfectly balanced with the wood texture in the foreground and blurred background. Click on it to read more about the soap and her inspiration in her Instagram post. 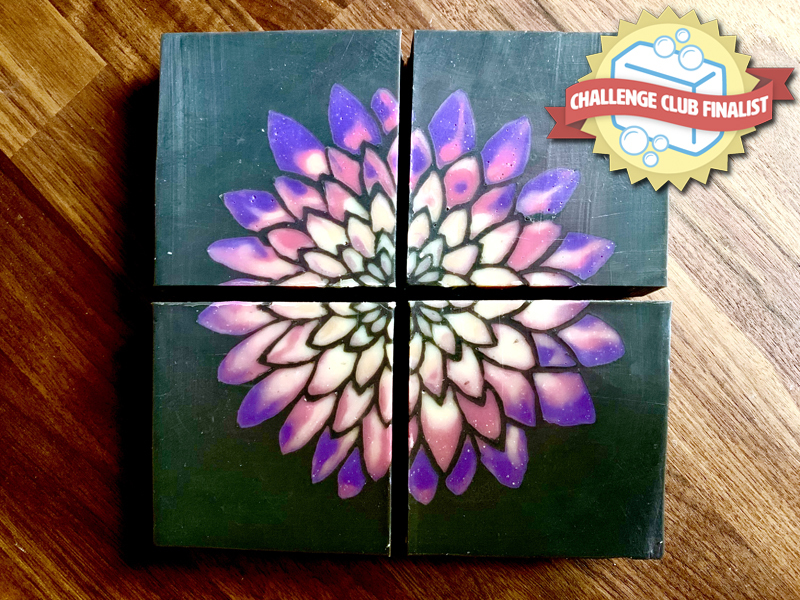 The embed for this soap is the half-cylinder shape used to represent the center of the flower. The petals and seeds were created with the inlaid technique. Emily created several versions of sunflowers in her quest for the perfect shade, which can be seen in her Instagram post that is linked to the photo. Her prize is a $35 gift certificate from Elements – woo hoo! She created the umbrella embed in a Pringles can, and the dancing rabbit silhouettes and umbrella handles are all inlaid. The lines are so perfectly clean and the contrast is stunning! Helene wins a $25 gift certificate from Elements!! Click on the photo to check out her post on her Facebook page with more photos of her process. Taina wins a $20 gift certificate from Elements. 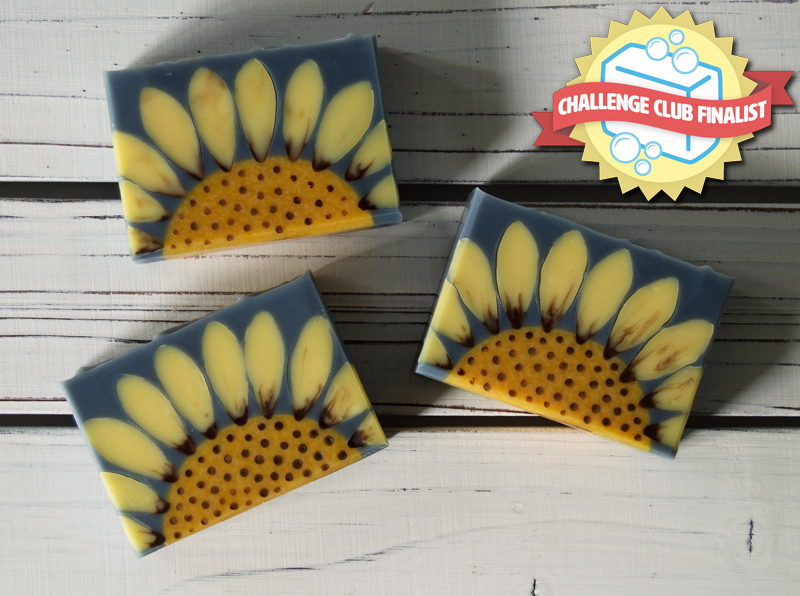 Click on the photo to see her process photos and the other fun soap she created from this batch on her Facebook post! I was super impressed with Jaimie’s engineering skills for her embeds. She created a 2-part embed for the cupcakes and another embed for the awning. 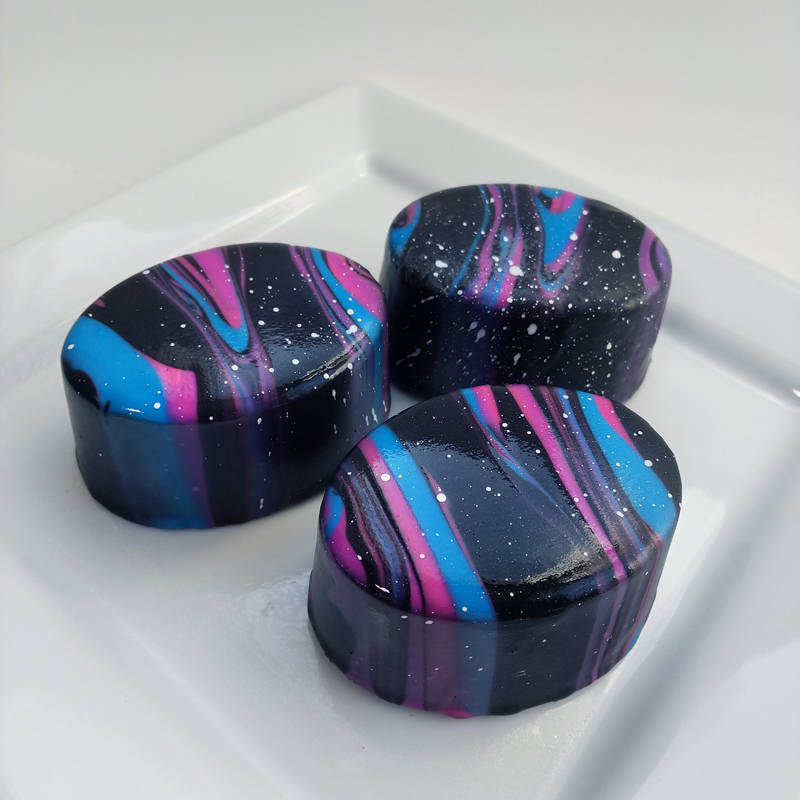 The precision of her inlaid designs is incredible, and all of the details really make these soaps something special and definitely unattainable with any other soapmaking technique. Jaimie did a great job planning out her design so that the embeds work together with the inlays. 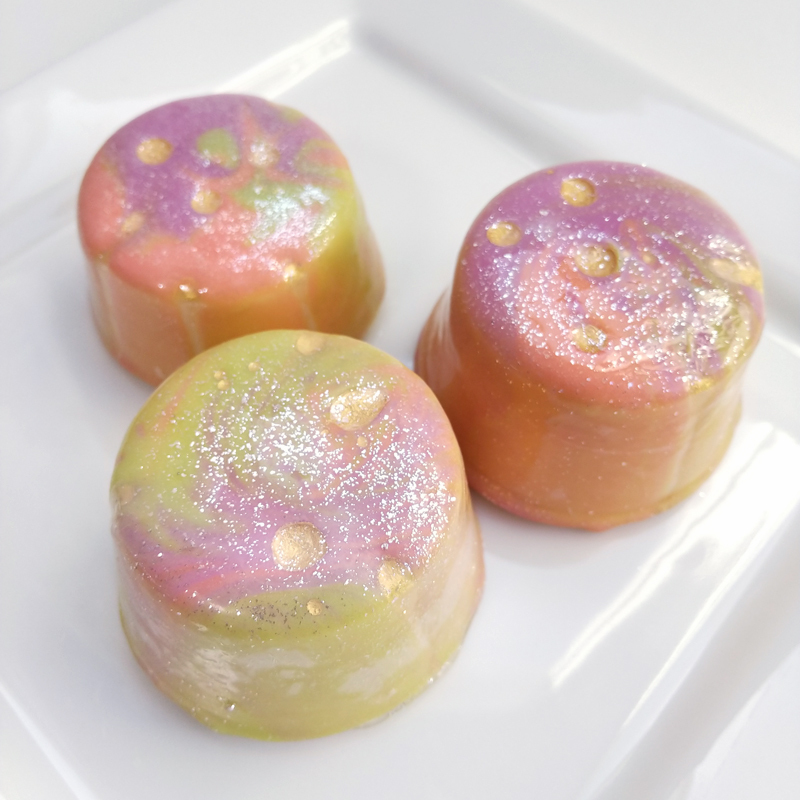 The photo is linked to her blog post with a comprehensive tutorial on how she created the soap. I love how Cheryl created four different types of flowers with the same set of embeds as the centers! She was very crafty in how she inlaid the petals and created some really lovely shading and variations of colors. Even the green to tan layers in the background enhance the flowers and create the illusion of greenery. Feel free to click on the entry photo to see Cheryl’s post on Instagram with lots of process photos! 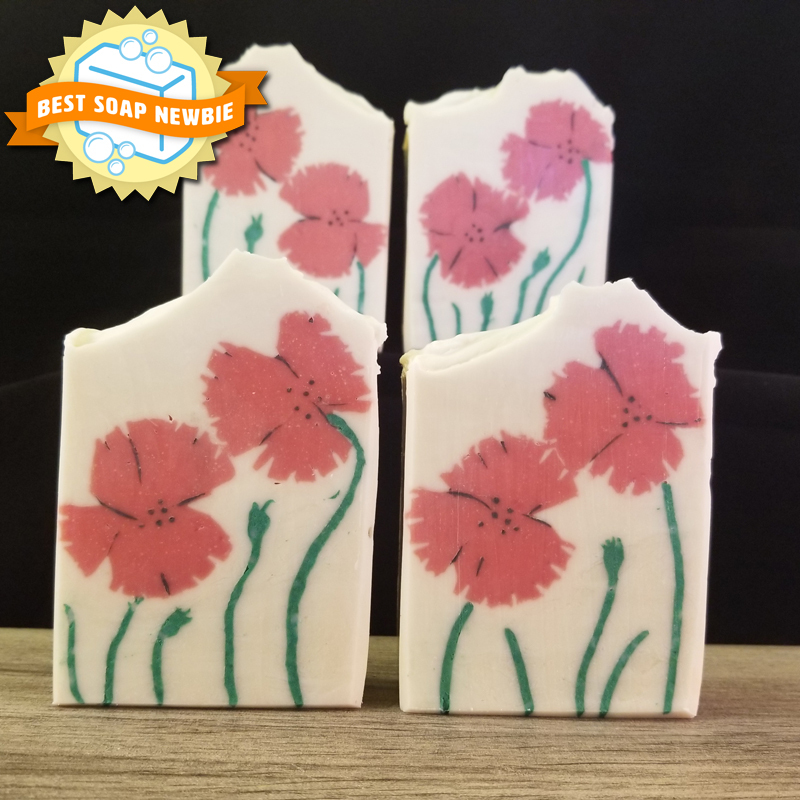 I’ve chosen Rhodana Fields in Maryland to receive the Best Soap Newbie award for her Peaceful Poppies soap. 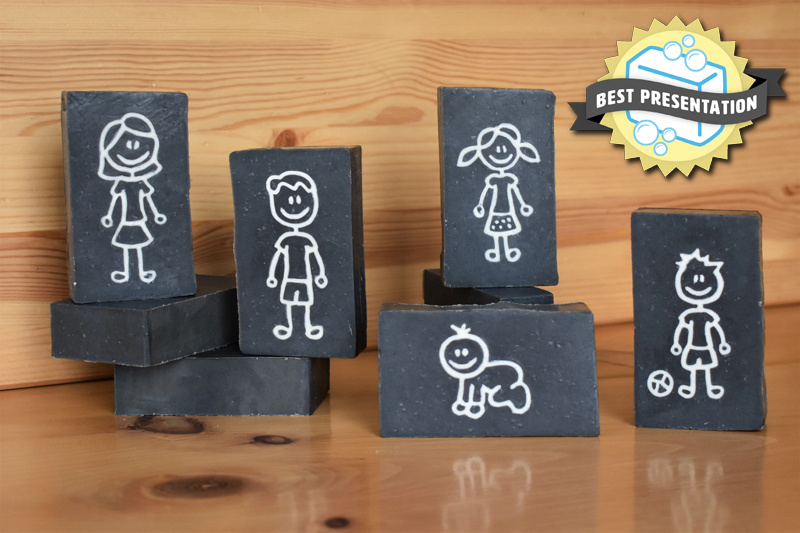 This award is only given to those who have made soap for less than a year and fewer than 50 batches. Rhodana actually won this award last month in the regular category! 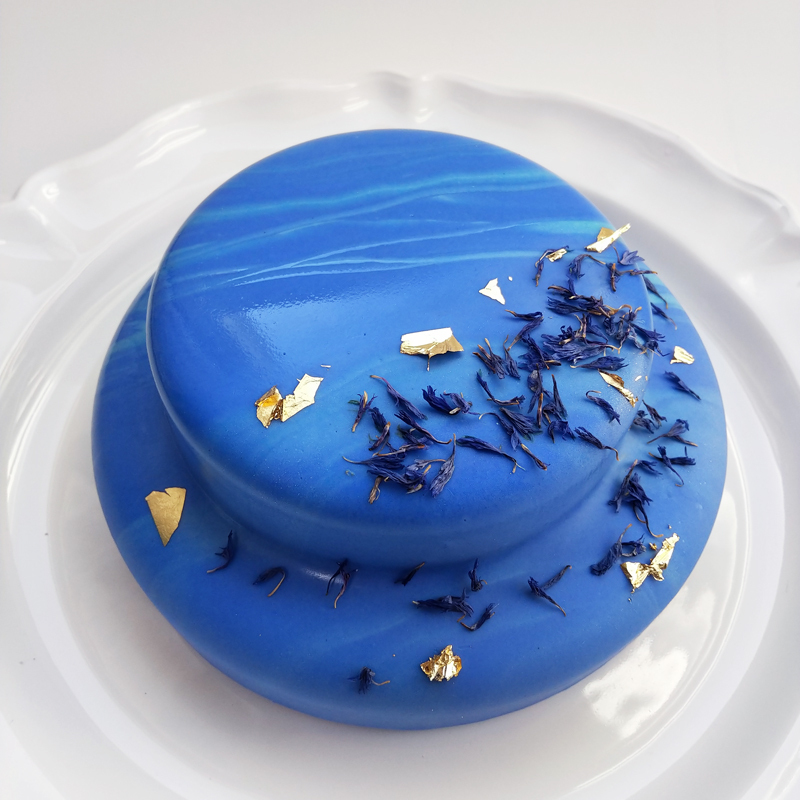 It’s certainly not easy to compete with more experienced soapmakers as a newbie, but Rhodana’s skills are certainly making quick progress! She created the poppy heads as “the world’s ugliest” embeds and enjoyed many firsts in the course of completing her soap. 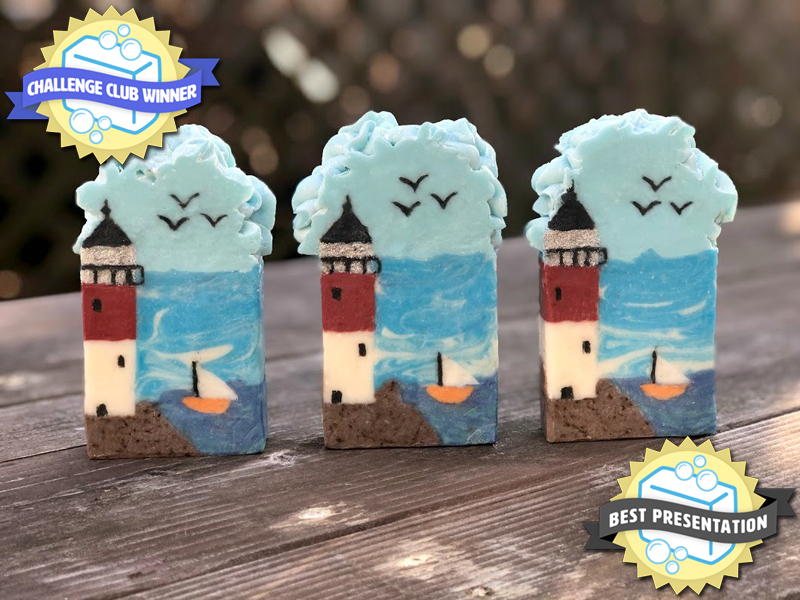 Click on the photo to read all about her process, see the embed, and why she was compelled to make this soap on her Instagram post! 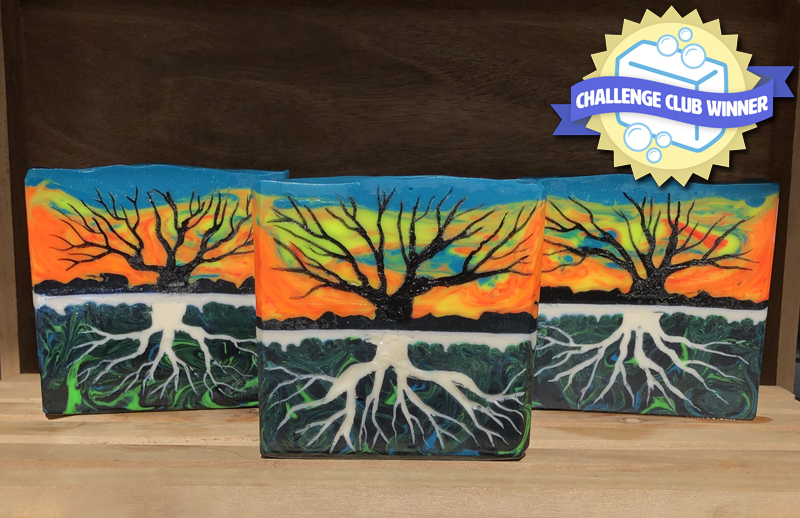 Jodi’s soap was inspired by an art piece plus a color palette she found on Pinterest. Her interpretation became a piece of art in its own right, with beautiful, yet opposing colors to create the illusion of the tree and root system. The fruit of her efforts is a $50 gift certificate from Elements – fantastic!! The photo is linked to her post on Instagram where you can see progress and inspiration photos as well. 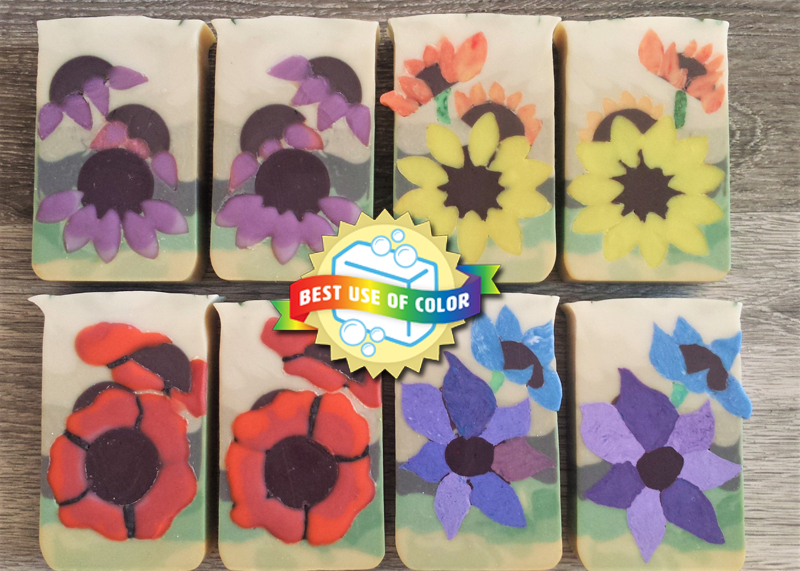 Dahlia soap by Pirate and Pearl Soap Co.
Lindsey did a fantastic job with her soap, creating an entire canvas with her flower pattern. The shading of the petal colors really enhanced the design, and the difficulty of the carving is also to be admired! Lindsey’s prize is a $35 gift certificate from Elements. 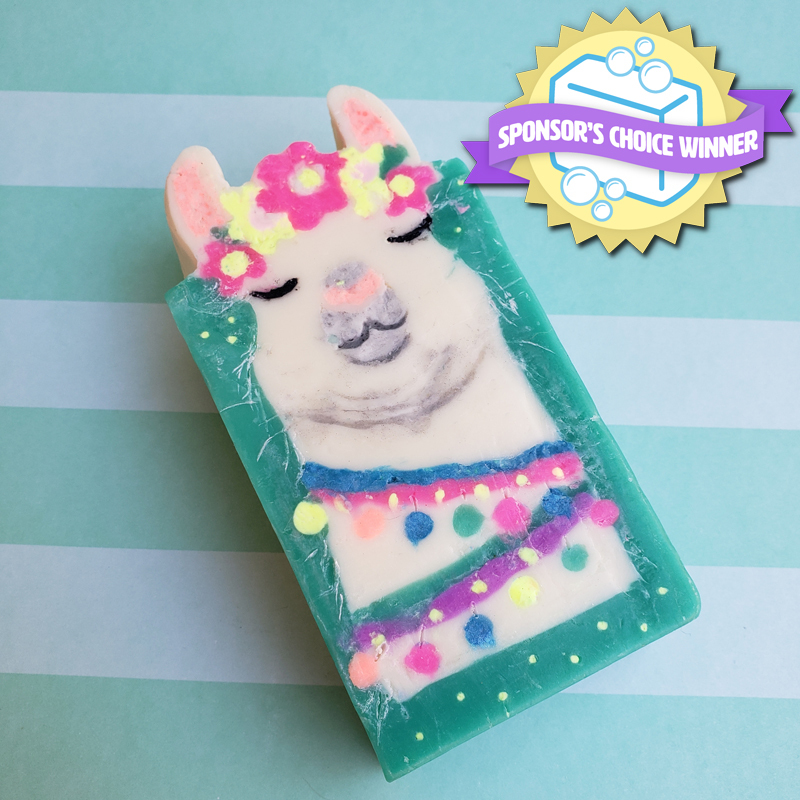 Check out her Instagram post about her soap by clicking on the photo! Each piece has an element of water to it that brings them all together, and because of her testing, she was able to get the colors she wanted for each tiny cavity. 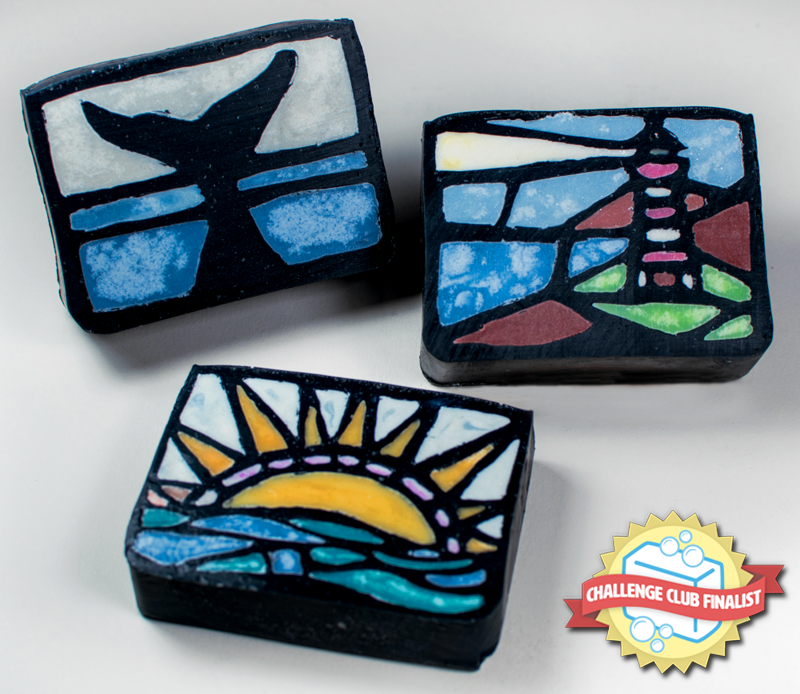 Dawn did a lot of carving to make these stained glass soaps come to life, and her reward is a $25 gift certificate from Elements! You can click on the photo to see more photos of her process on her Instagram post. 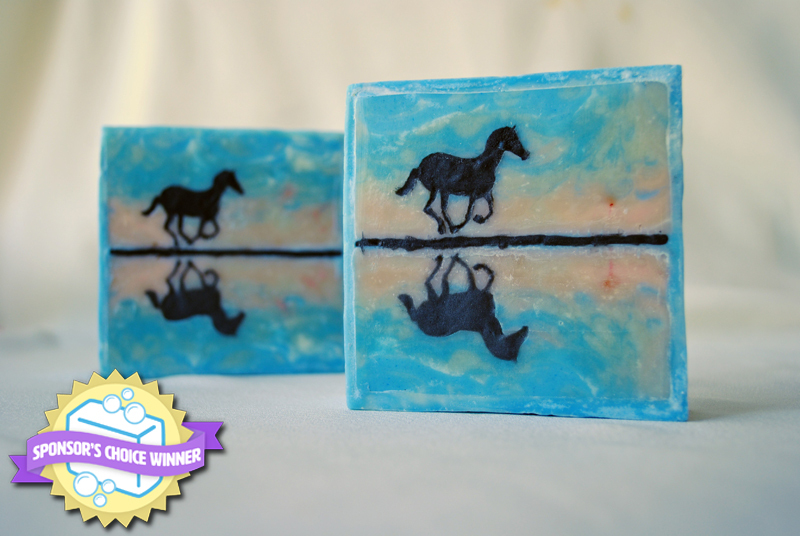 The Sponsor’s Choice award goes to Svetlana Moiseyeva in the Ukraine for her Sunset by the River soap! 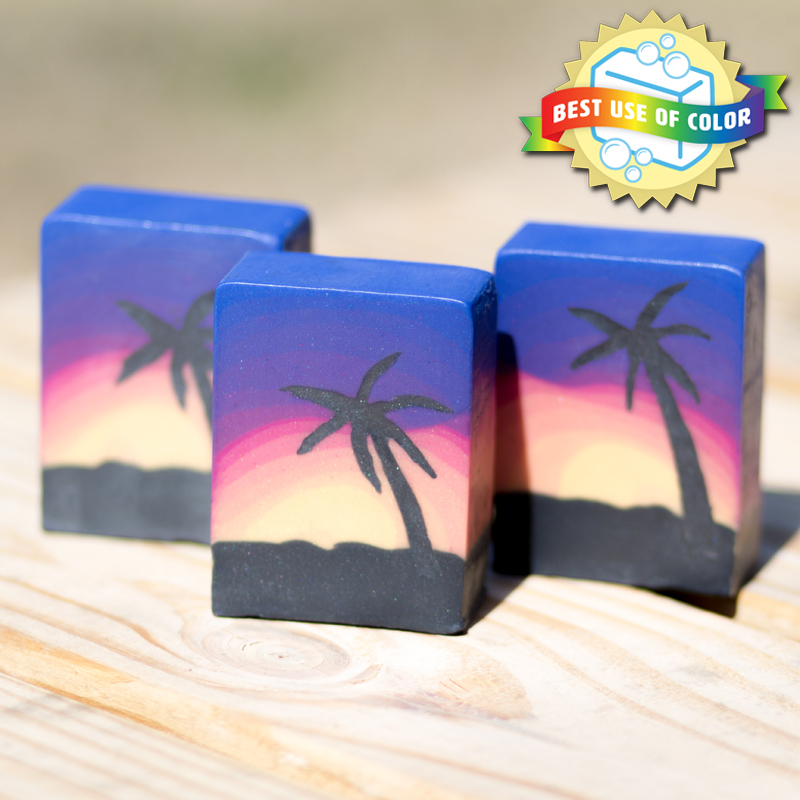 The Elements team says, “Sunset by the River really evokes the feeling of tranquility; it’s just gorgeous!” I was also impressed with the soap as Svetlana is very new to the soapmaking process! Recognition awards for the regular category are next! Starting with Best Technique, I wanted to choose an entry that obviously could not be made with any other technique, the carving was neat, and the inlays were an integral part of the design. I had to choose Tiziana Cherubini’s Rubik’s Cube soap! If you click on the photo, you can see more photos of the soap from every angle in Tiziana’s Facebook post. 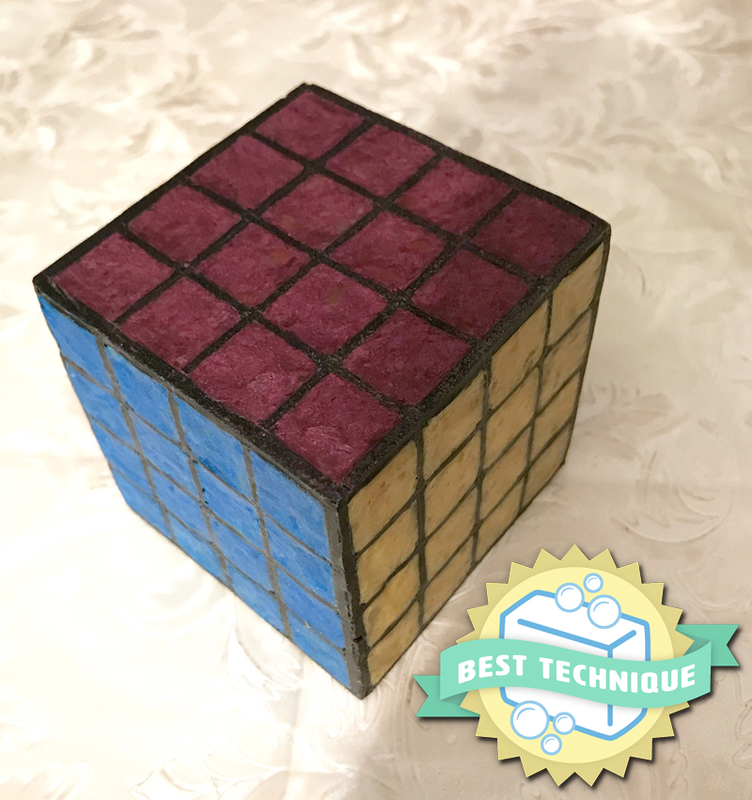 She carved and inlaid every side of the cube with a different color! Very impressive work! The photo itself is balanced, well lit without shadows, and all the soaps are in focus and fully presented within the photo. Great job, Conny! You can click on the photo to see and read more about Conny’s process on her Facebook post. The monarch butterfly is especially beautiful and realistic! Please click on the photo to read and see more about Kayse’s process as well as her inspiration photos on her Facebook post! Registration opens Monday, April 1st for the April challenge! More information on the Current Challenge page. Sign up to be notified as soon as registration opens HERE.